A video showing Covington Catholic High School students in an apparent confrontation with a Native American activist at the Lincoln Memorial in Washington, D.C., went viral this weekend, sparking outrage across the country. 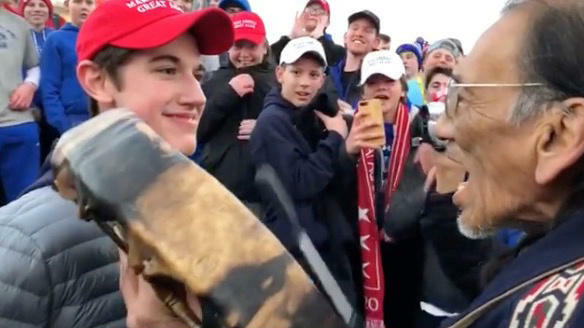 The video showed Covington Catholic student Nick Sandmann standing face-to-face with Omaha Elder Nathan Phillips. Phillips played on a ceremonial drum as a group of students surrounding the two chanted and seemed to be mocking Phillips. Since then, the story continues to evolve as several other videos and more information about the incident and individuals involved has surfaced. Joining Cincinnati Edition to discuss the story, and what role social media played in shaping public opinion and how the media reported the story are Xavier University Assistant Professor of Communications Dr. Leslie Rasmussen; Cincinnati based writer Julie Irwin Zimmerman (@JayZeeCincy); Head of the University of Cincinnati's Journalism Department and McMicken College of Arts and Sciences Associate Professor Dr. Jeffrey Blevins (@JeffBlevinsPhd); Cincinnati Public School Board Member Mike Moroski (@mike_moroski); WVXU reporters Ann Thompson (@annthompsonwvxu) and Bill Rinehart (@billgrinehart); and River City News Publisher and soon-to-be host of Cincinnati Edition, Michael Monks (@micmonkssmedia). Tune in to Cincinnati Edition Jan. 23 at 1 p.m. to hear this segment. Covington Catholic High School says a third party investigation will begin this week into events surrounding an interaction between a Native American and students in Washington D.C., on January 18. On Tuesday, the school was closed because of threats and groups representing Native Americans held a rally.